Posted on Jan 20, 03:34 PM in Well Being. No comments. “Eat like a Dietitian – what Dietitians eat in a day”. To be honest, this is usually not that interesting. And probably a bit of a fib. Most of us are just normal people who eat normal food. We live by the principle that there is no such thing as a“bad” food and really don’t really like promoting the idea of “superfoods” and perfect diets. Your average Dietitian will be a fairly ordinary, food loving creature who enjoys eating most things in moderation. Eating healthy isn’t just about the individual foods we eat, it’s about the whole picture. It also includes attitudes and our relationships to food and eating and is also about the social connections we make in the process. 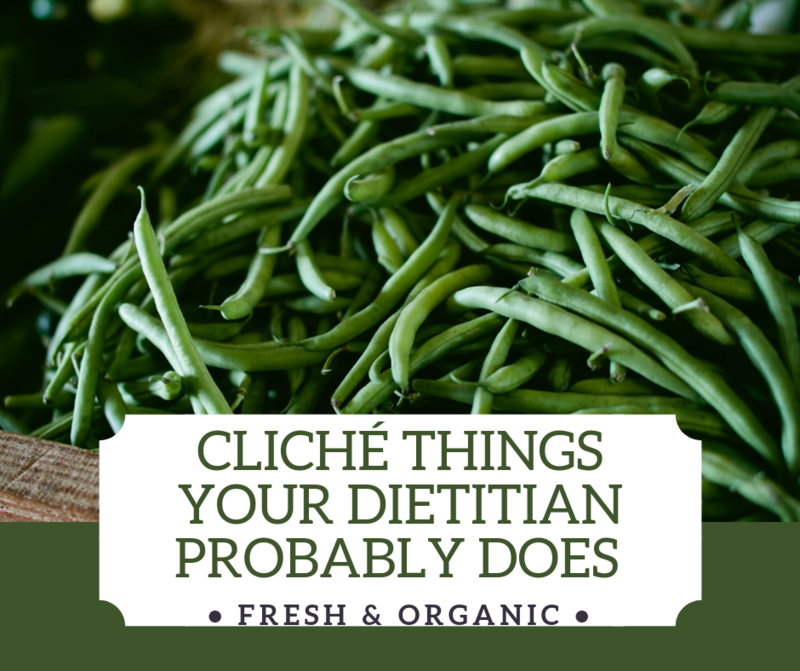 That being said, I thought it would be fun to find out some of the things and ways that Dietitians DO eat, that could be considered to be, well, a little cliché. So, I asked around! Here are a few of the little “cliché” things that some Dietitians, from around the world, actually include in their everyday meals. Meal balance is something that lots of Dietitians do take into account when eating. Kiah Paetz, from plant nutrition and wellness says” I do try and portion all my meals into meals 1/2 plate veg and 1/4 plate protein and 1/4 plate carbohydrate”. Breanna Woods also has a portion strategy. “When eating out, I usually take half of my food home. It helps me keep portions in check and I love having leftovers for the next day!“. Lisa Cicciarello Andrews, from sound bites nutrition balances her meals. “I eat protein (peanut butter or cottage cheese) with fruit. It gives me more energy!”. So, does Diana Reid, the global dietitian , who tries to get protein and veggies at every meal, including breakfast. Quite a few of us are genuine vegetable lovers. I love vegetables and salad and try to add them to every meal. I am in good company. Petra Salo always aims to have at least half of her plate filled with veg at lunch and dinner. Lisa Bailey is a busy lady but also adds vegetables “I also use frozen fruit and veg on a regular basis to save time and money”. Julie Wallace Dietitian Nutritionist told me “I actually only drink water. Plain boring water. Granted its easy when you dislike carbonation (soda) and can’t have caffeine at all (coffee and most tea). I could indulge in sweetened decaf teas and hot chocolate though as well as alcohol, but I save those for special occasions. Amy Featherstone RD agrees “I am the same = even on holiday! Kate Roberts RD, eats porridge every morning with seeds in, takes probiotics and monitors what her kids eat like a hawk! Although she does let them have treats! Adele Anderton and Ashleigh Macaskill both love linseeds. Ashleigh says “I add linseed to everything I can. Amy Featherstone likes to watch people’s food trolleys “I like looking at what people are buying at the supermarket not because I’m judging but because I’m interested in what varying demographics purchase. So my cliché items? Well I can’t live without breakfast either and tend to choose porridge or my old favourite Bran style cereal. I love a salad and try to avoid eating between meals. But mostly, I just try to eat like everyone else. I guess, however, none of us can help being a little cliché now and then.